Whether you’re going camping for the weekend, exploring the land around your homestead, or learning about edible plants and medicinal herbs, knowing which plants are highly toxic is essential. Never, ever, consume a plant you have not positively identified as safe, OR that is a look-alike for one of the poisonous plants. 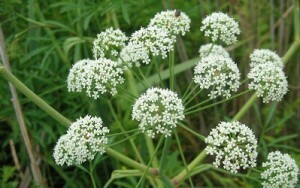 For example, wild carrot is not poisonous, but its look-alike Water Hemlock is the most toxic plant in the US – a single drop of ingested sap can kill a child or adult. Some plants are safe to handle as long as they are not ingested. Other plants can cause severe burns, rashes, and more just by brushing against the plant or getting sap on your skin. If you suspect you have had physical contact with one of the irritating toxic plants, immediately wash the area with warm water and soap, and seek proper treatment (like calamine lotion for Poison Ivy). If you have children, one of the best things you can do is teach them to identify and avoid poisonous plants. Even a toddler can get interested in learning plants, and remember characteristics of toxic plants (like the “leaves of three, let it be” to identify and avoid poison sumac, poison ivy, and poison oak). 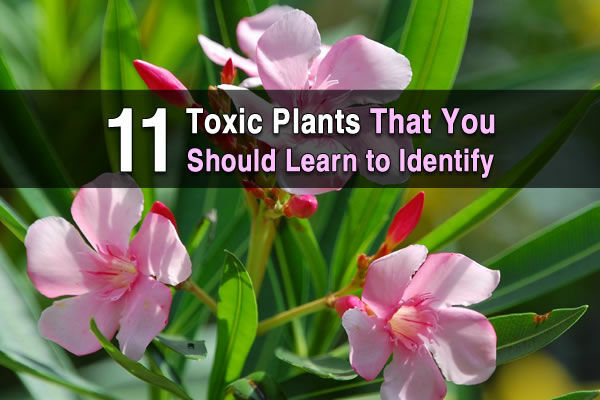 Here are 11 common toxic plants to beware of. Water hemlock is a lacy plant with broad umbrellas of white flowers. 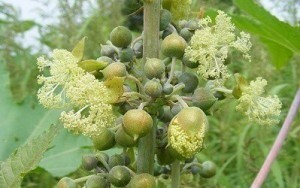 Its leaves resemble those of carrot, and also elderberry. 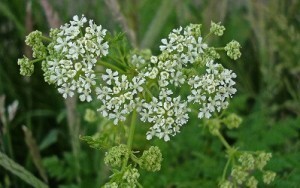 Unlike carrot and elderberry, however, it thrives in wet and marshy areas like stream banks and lakeshores, or marshes. To avoid water hemlock, avoid all carrot-looking plants growing in or close to water. This large plant prefers pasture, and the sunny edges of forests. Contact with the sap causes blisters, swelling, and sever photosensitivity that can cause second and third degree burns with sun exposure. This plant should be avoided, or reported. One should not attempt to chop (or burn) it on one’s own, it would require a hazmat suit. Not quite as poisonous as water hemlock, poison hemlock has only slightly different characteristics. It is a showy white-flowered plant with purple-spotted hollow stems, and leaves resembling parsley or carrot in their growing habit. 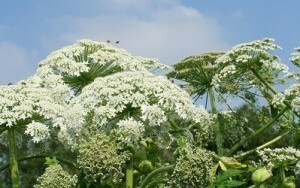 The danger with poison hemlock is confusing it with wild carrot, or Queen Ann’s lace, which are not toxic. Possibly the most common plant to cause painful irritation and rashes, poison ivy is found throughout North America. Its growing characteristics include leaves in groupings of three, pointed leaf tips, green leaves in spring, and yellow leaves in fall, with white berries. 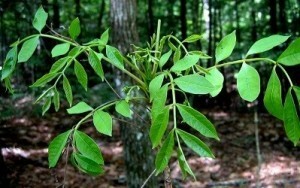 Any contact with poison ivy can cause a rash, including if it is on your clothing and you touch the contaminated spot. If you come in contact with poison ivy (or poison oak and poison sumac), do not touch any other part of your body with the contaminated part, and do not touch your clothing. Wash clothing as soon as possible, and wash any skin area the plant touched with soap and warm water before applying soothing lotions or other treatments. From the same family as poison ivy, poison oak also has similar characteristics. Poison oak has leaves in sets of three, is a low-growing plant that has green leaves in summer, and rich orangy red leaves in the autumn. 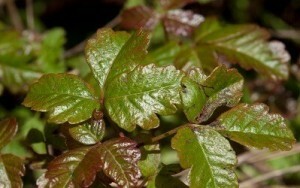 The irritant in poison oak is the same as that in poison ivy, and the treatment would be the same. 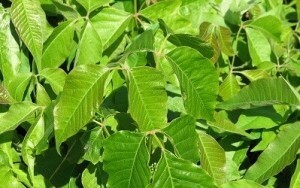 The foundation of the family, along with poison ivy and poison oak, this plant has very similar characteristics as well. Namely the leaves of this plant also growing in groups of three. This little group of three plants is why the “leave of three, let it be” is good to remember, then you’ll never go tramping through a growth of them accidentally. Since the irritation from the Toxicodendron species is caused by an irritating oil, the most effective way to prevent it is washing the oil off your skin as soon as you realize you have come in contact with it. A showy and sweet-smelling ornamental in the dogbane family, this plant is toxic if ingested. There is no part of this plant that is not toxic. It bears a slight resemblance to an olive, and also to the also-poisonous rhododendron. The flowers grow in showy clusters, and can range from white to red with shades of pink in between, with dark green lance-shaped leaves in alternating pairs, sometimes whirls of three instead of pairs. 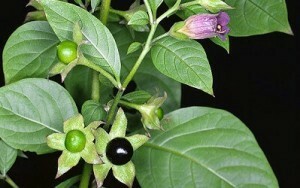 While nightshade has a history of cosmetic use, its foliage and fruit are all highly toxic. It bears a resemblance to the potato, with similarly shapped leaves. 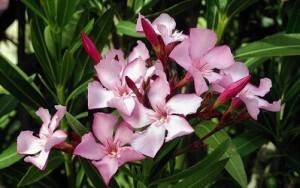 Its flowers are tubular with five petal-points, usually purple in tone. The fruit is dark purple black, and is the most toxic part of the plant. The yew is one of the few evergreens that grows flat needles. The needles appear flat, and are paired, giving the branches a flat feathered look. 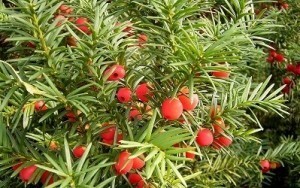 Unlike most conifers, the yew tree has a bright red, fleshy, berry/cone which holds the highly-toxic seed. Both the foliage and the seed of the Yew tree are poisonous, and during some European wars, there were reports of soldiers dying after drinking from yew-wood canteens. Caution should be observed when working with yew for any reason due to this toxicity. This is a very pretty purple flower which vaguely resembles a hooded monk. 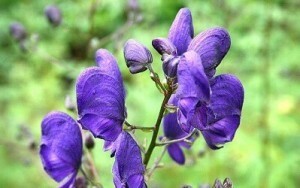 Traditionally, the Aconitum spp. were used for poisoning wolves, by farmers, hence it’s other common name of “wolfsbane.” All parts of Monkshood are poisonous to humans and animals. As a quick rule of thumb, any flower that has a deep tube or trumpet shape (fox glove, petunia, lilac), is likely to be poisonous, no matter how good it smells. Also, bulb flowers that are trumpet shaped, like Easter lilies, daffodils, and narcissists, are also poisonous and should be avoided. Of course, there are exceptions to every rule, but if a plant has these characteristics you should only consume it after positively identifying it as safe, by 3 different people and/or sources. The castor bean plant is from the spurge family, and is highly toxic. Even though edible castor-oil is produced from it, the oil is only safe because the process is designed to remove the water soluble toxin, ricin, from the oil. The castor bean specifically is the most poisonous part of the plant, and a single ingested bean can kill an adult. The castor plant is a common ornamental due to its showy feathery red flowers, and multi-fingered green-purple leaves. As I said at the beginning of the article, you should only touch plants that you are positive are safe AND don’t look like any toxic plants. Remember, even if you’re sure a plant is safe, if it has a toxic lookalike, then you risk making a deadly mistake by handling it. Better safe than sorry.